I’m not sure I’ve ever been in the explicit position of being denied something because I don’t believe in God…until now. When the Boy Scouts of America (BSA) changed their rules to allow gay scout leaders last summer I was cautiously elated. As the mother of a 9-year-old boy who would enjoy and benefit from a scouting program we had never felt comfortable signing up with an organization that was vocally unwelcoming to people of other sexual orientations. Our participation would have felt like tacit approval of their discriminatory practice. We had been hopeful for the change ever since the scouts had opened their door to openly gay participants in 2013 and for a moment thought that we were finally comfortable with the organization. We had dreams of finding a local troop of mindful progressives to call our own. Luckily we put it on the back burner because the news lately makes it crystal clear that our own family is not welcome. The BSA is going out of their way to remind families that it is not a specifically Christian organization, that a child must simply have a one-way statement about his beliefs pertaining to any God, be he Jewish, Muslim, etc. What it very clearly does not leave room for is a belief in no God. So basically, No God = No Scout. That one leaves us out. 1. Does including “duty to God” as a part of Scout spirit put too much emphasis on religion? Does it create a requirement of belonging to a religion? No, not as written. There is no requirement that a Scout identify a religious faith as part of his duty to God—although, if the Scout does have a religious faith, it is likely to be part of the self-reflection and expression. It is important to note that Scouting is nonsectarian and promotes no specific religion. In fact, a boy need not belong to any official religious institution—he could practice his beliefs privately at home. However, while membership in an organized religion is not necessary or implied, a Scout does have to ascribe to the declaration of religious principles, and express belief in a higher power. This condition of membership is acknowledged by the parent or guardian’s signature on the BSA Youth Application. Apparently baked into the BSA application all along has been the requirement that parents acknowledge a child’s belief in a higher power. Who knew? Apparently a lot of people heavily involved in scouting did know according to comments on the BSA message boards and Facebook pages. What’s interesting to me though are the families of long time scouts who openly do not adhere to the principal feeling like it was never really a deal breaker, rather it was just a throwback to the early days of not just scouting, but America where belief in God was the default. These are people who are vocal about their own family’s agnosticism or atheism while at the same time loving scouting. Equally interesting are the people who consider the BSA to be a God-centered organization first with all the service and outdoor stuff second and who call those previously mentioned people heretics and liars who have shunned the most fundamental tenant of scouting: honesty. Clearly, there is a rift at the heart of the BSA. It’s a rift that as an atheist family we are used to especially in the incredibly conservative Christian community we live in, but this time it’s personal. I’m not sure I’ve ever been in the explicit position of being denied something because I don’t believe in God. Non-Mormons are not allowed in Mormon temples and there are plenty of Orthodox sects of all religions that have requirements for participation in rites and membership. But none of that is on the scale of a national organization that openly recruits in public schools and who vocally welcomes over a dozen different types of religions at its table. An organization whose sheer size makes it impossible for other more open and progressive scouting organizations to exist outside of large cities. 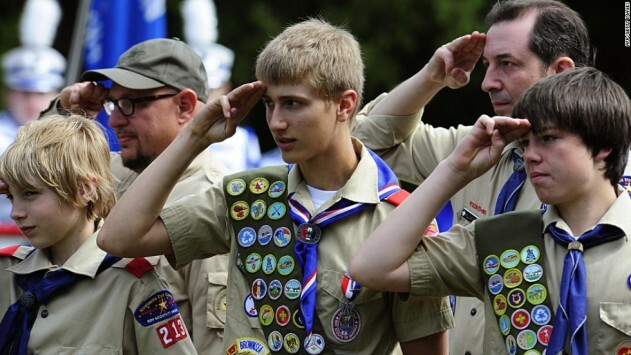 Comments on message boards suggesting atheists start their own groups fail to take into account that the BSA has almost wholly cornered the scouting market. The BSA is the only game in town for a lot of families and some of us don’t make the cut. There are also plenty of comments that atheist kids can just say they worship the God of nature or humanity or other equally wishy washy non-statements of faith that would be offensive if suggested to members of established religions. “How about to make us comfortable so I can check off this box you just say you’re a Christian but leave out the Jesus bit?” or “So yes, you’re Jewish, but for the purposes of this form is it cool if you proclaim Jesus as the son of God?” “Can we just leave out Mohammed this time?” Nobody would question that as offensive. But somehow it’s fine to suggest atheists just pick a straw god for the purposes of a requirement. This goes far to show how clueless some religious people can be when it comes to understanding atheists as well as undermining the supposed importance of the requirement itself. The BSA is shooting itself in the foot over the long term with their belief in God requirement as the country becomes increasingly secular. They’ve already alienated the hard-core conservatives by admitting gay members and leaders and now they’ve carved off a chunk from the other side too. It’s hard to imagine them not changing tack some day in the future but by then it’ll be too late for my own kid. Who does have a place? The playground bully who picks on everyone smaller at recess and who regularly tells my own kid he’s going to burn in hell because he doesn’t believe in God because the playground bully does believe in God, a grumpy God who thinks it’s fine to torment children. My son, a child who received an award from the Rotary Club at the age of 7 because he took it upon himself to help out his autistic friend with his classwork when he realized it was a challenge for him. My son, who refused presents for his birthday but instead asked for food for the animals at the local humane society. My son, who used every one of his raffle tickets at school to win a bike that he immediately gave to his sister because that was his plan all along. My son, who asked not for presents for Christmas but for food for the homeless. Does he sound too good to be true? For the Boy Scouts he is. They don’t get to have him. These are the types of kids the Boy Scouts of America say aren’t good enough for their group. The Boy Scouts can keep their badges and knee socks and little red neckerchiefs. Our good boy will continue to be good without them.